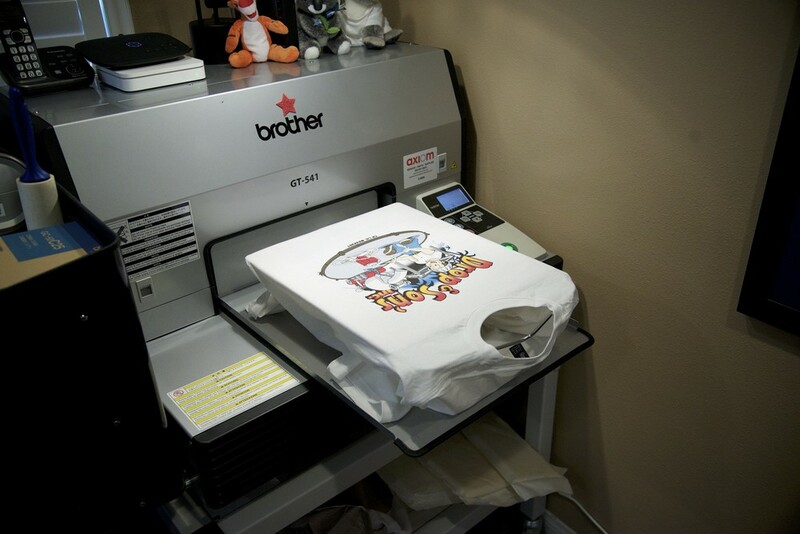 Koala T's offers a full range of screen printing services for personalizing t-shirts, sweatshirts, totes, etc. All of our printing is done on our M&R automatic screen printing press which is simply the best in the screen printing industry. Let our experienced staff help you select a garment from our extensive catalog and we will decorate it with your custom design or logo. We have no set-up or screen fees and free underbasing. While screen printing with plastisol ink is the most popular way we print, we can also decorate with a variety of specialty inks such as glitter, shimmer, metallic, foils, puff, glow in the dark and even a clear ink that creates a wet or shiny look over any ink color. Do your style guidelines require a specific color? No problem. We offer the Pantone Color Matching System for precision color matching. DTG utilizes the latest digital technology to print directly into the fabric and may only be used on light-colored garments. The water-based, eco-friendly ink penetrates the fabric so it will never peel or crack and produces a very soft, "non-plastic" feel. This process is ideal for customers looking to produce very colorful or graphic intensive garments with maximum flexibility. There are no minimum quantities, no set-up or screen fees and turn-around as fast as one day. Whether you want one shirt or one hundred, DTG printing can be a perfect solution for you.